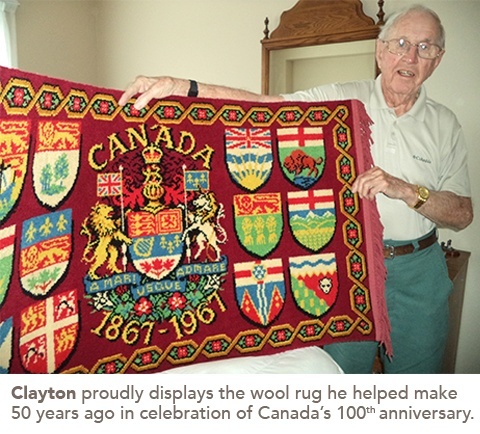 Clayton is proud to still own a carpet he helped make in honour of Canada’s centennial year. The soft noise, not unlike fabric rubbing together, fills the room as the mechanical loom works. Thousands of wool strings are woven together, producing a striking red rug in celebration of Canada’s 100th birthday. At the time of the carpet’s production, Clayton worked in a subsidiary of Toronto Carpets in Campbellford, making axminster carpets. He was a manager in the setting department, which is where they setup the rug patterns. During the years of 1966 and 1967, the company made commemorative rugs in celebration of Canada’s centennial year. There were a limited number of rugs made, but Clayton said that everyone working at the factory was given an opportunity to buy one. By the time Clayton was old enough to join the war effort, it was almost over. He joined at 18, and by the time he finished basic training, WWII had come to an end. In 1947, at the age of 21, Clayton got married to Barbara, who he’d met a few years before. He began working at the carpet factory that same year, and continued to work there for the next 25 years. He and Barbara had two children, a boy and a girl. After the children were grown, Clayton and Barbara moved to Cornwall, and Clayton worked there until he retired. “There’s been an awful lot of change since then,” Clayton said. He explained that the carpet factory he worked in is no longer there. However, since moving into Island Park Retirement Residence in Campbellford a few months ago, Clayton has seen some of the people he worked with in town. Though many things have changed since 1967, Clayton believes Canada will fare well in the years to come. View extraordinary resident art in our new 360° virtual art gallery!